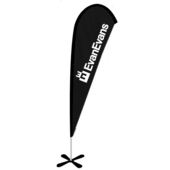 The choices of teardrop flags at Evan Evans means that we have a perfectly suited option for every kind of design and brand in Melbourne and Sydney. Teardrop flags are a subtle but smart way to advertise, and our high-quality designs combine amazing printing with outstanding graphic design. With a range of sizes and designs, our customers have the freedom to express their brand and creativity in a range of different ways. 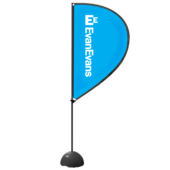 Evan Evans boasts a fantastic range of portable flags that are ideal for using at corporate events and promoting your business. We supply our teardrop banners Melbourne and Australia wide and can provide you with a range of teardrop flags and display accessories to meet your needs. No matter what your requirements are or how big or small the job is, we’re dedicated to finding a solution. With everything from lightweight, fast set-up feather banners through to large-scale tear drop flags and eye-catching media backdrops, Evan Evans has what you need to guarantee that your business receives maximum exposure and your message is delivered loud and clear. Our range of Euro flags and flagpoles come in a variety of sizes and shapes and are the perfect way to make sure you get noticed. Featuring vivid colours and made from durable materials, our Euro range products can be fully customised using revolutionary digital printing techniques and are surprisingly cost-effective. Products in this range include spinnaker, waver, feather and teardrop flags. We also stock a large range of accessories made specifically for the Euro range, including weighted ground mounts and carry bags. Need teardrop banners in Melbourne, Sydney, Perth, or elsewhere in Australia? Evan Evans’ JBM range has everything you need to stand out. From teardrop banners through to the attention-grabbing OZZ Pole, we have you covered with our fantastic JBM range. We can also provide accessories made to fit your JBM teardrop flags and banners, including carry bags, water bases, cross bases and turf spikes. Evan Evans can also re-skin your old teardrop banners with new artwork and printing to give your business a fresh look. For more information on any of our items or to request a quote, contact us today.